The poor German guy next to me was trying to get around the slow girls in front of us. He nearly tripped over me as he made his break, and I decided to wind off him for the next few miles. It was working, too. This was the Berlin Marathon, one of the fastest courses in the world, and I was bound to get a personal record this year. Berlin is an easy weekend trip from Paris, so with no issues of jetlag, a tummy happily full of the previous day’s Chinese and Thai food, and a few gels pinned to my shorts, I was in it to win. Well, I would win metaphorically speaking. The Kenyan who actually won had probably already finished by the time my resolve was kicking in fully. And his insoles popped out of both shoes on the way! Anyway, back to me. So there I was, barreling through the crowd of some 40,000 people, following this tall, older German guy for the better part of ten kilometers He had a nice pace, totally on par with what I needed to be doing to crack a four hour marathon. I was downing gels as he was, sprinting to catch up as he sailed through the water stops (he had his own bottles – I needed to grab a cup each time). We were going strong for a while. I’m pretty sure he knew I was there. I’m equally as sure that he wasn’t happy about it. But I continued with him, seeing the kilometers tick by and the clock smiling at me with a brilliant pace. I felt like I was flying. Was my watching broken? Then somewhere past the halfway mark I lost him during a water station and I felt lost and alone, but I could see his hat in the distance and kept pace. He was there, I knew it, and I kept heading forward. The Clif Bloks I had were giving me bursts of energy, making me even happier I had them brought over from the US. The water was cool, the sun was tolerable, and the temperature was perfect. The crowds were almost as enthusiastic as last year’s in Chicago, with people along the entire route, shouting, cheering us on, making loads of noise. This was the most amazing marathon ever. I wanted to shake that man’s hand at the end, but I lost him. Maybe I passed him. Either way, I was sailing by happily through the late 20s and early 30s – while simultaneously fighting off any negative head games with a giant sword of positivity. 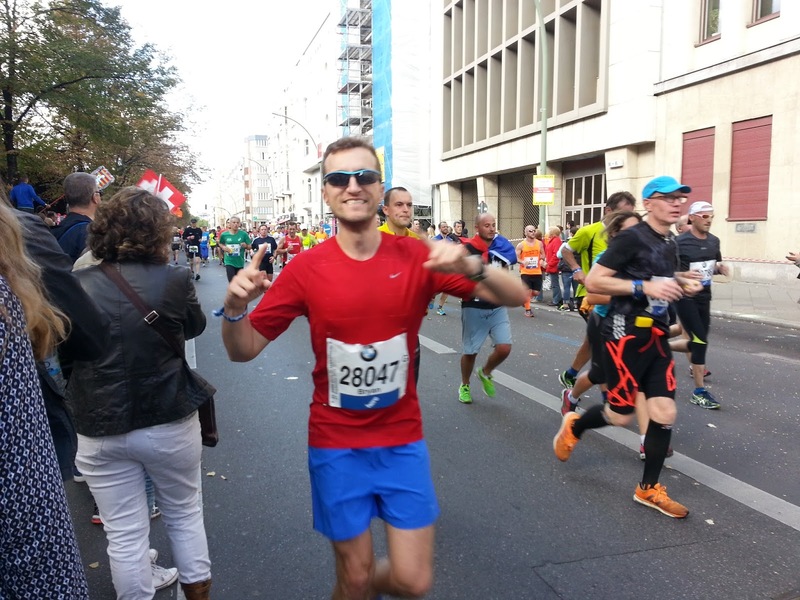 My other half spotted me a few kilometers before the end, around kilometer 37, and I was absolutely beaming, I could hear the roar of the crowds in downtown Berlin as we approached the Brandenburg Gate, just a few hundred meters from the finish line. “Keep smiling but don’t trip,” I told myself over and over again. I didn’t want to risk it all so close to the end. The tears swelled up again because I knew that at that pace I had broken 4 hours – something I had only done twice before. Tears of joy, of course, and I fought them back a bit, sailing through the gate. I was slightly confused and angered to find that the end was still a few dozen meters after the Brandenburg Gate, but I continued down to the finish line, grinning like a fool. Then I looked at my watch. 3 hours, 48 minutes, 12 seconds it said. I hadn’t stopped it once, so I knew it wasn’t lying. I had just shaved about ten minutes off my last marathon and I felt amazing. I continued to pat myself on the back as I was given my medal, and as I steered myself towards the beer tent to claim my other reward. The next few days were filled with sightseeing, beer, currywurst, cake, and the best doner kebab I ever ate. I feel it was all well-deserved. Berlin, you put on a really good marathon, and it will be with great pleasure that I will one day return and nab another personal record. Danke! Oh my God. First of all, kudos to you for trying let alone finishing it. You're an inspiration to many and my God do those kebabs look delicious! Amazing article.